Journal of Waste Recycling is an international open access peer reviewed publication that focuses on the optimum utilization of the natural resources with social responsibility, by emphasizing on recycling and waste management. The journal aims at unearthing the recent innovations and developments in this field with a view to check the global warming. 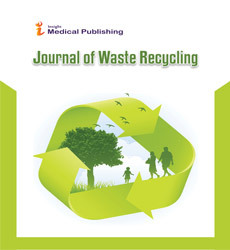 The journal covers several key aspects this field by including research on categories including Waste management, raw materials, Sanitary engineering, Resource efficiency, human biodegradable waste, Incineration, hazardous waste materials, biological medical waste, resource recovery, Biological reprocessing and Co-processing. The chemical laboratory workers create waste which has to be handled according to the instructions. The chemical wastes are collected separately and treated accordingly. Some of the chemicals are recycled whereas others are disposed. Chemical waste is defined by the United States Environmental Protection Agency and by the Delaware Department of Natural Resources and Environmental Control. Definitions, management practices and compliance are outlined in 40 Code of Federal Regulations and the Delaware Rules Governing Hazardous Waste. Electronic waste (e-waste) is the discarded electrical or electronic devices. Used electronics which are destined for reuse, resale, salvage, recycling or disposal are also considered as e-waste. The need for e-waste management has been increasing from the past decade. E-waste is any refuse created by discarded electronic devices and components as well as substances involved in their manufacture or use. The disposal of electronics is a growing problem because electronic equipment frequently contains hazardous substances. The waste that is remained after the use of nuclear chemicals in the reactors. They are assemblies of metal rods, ceramic pellets, which are similar to the fuel loaded initially. They reacquire special techniques for their management and disposal. Nuclear waste is the material that nuclear fuel becomes after it is used in a reactor. It looks exactly like the fuel that was loaded into the reactor assemblies of metal rods enclosing stacked-up ceramic pellets. But since nuclear reactions have occurred, the contents are't quite the same. Recycling is the method used to convert the waste materials into products which can be reused. The common waste materials which have the potential to be reused can be recycled as raw materials, can reduce energy consumption, reduce pollution, reduce further pollution of water and landfills; reducing the need for waste disposal. Recycling is processing used materials (waste) into new, useful products. This is done to reduce the use of raw materials that would have been used. Special wastes are medical waste, pollution control waste or industrial wastes which on exposure to living mechanisms cause harmful effects. Also termed as hazardous waste. Special wastes can be any potentially infectious medical waste (PIMW), hazardous waste, pollution control waste or industrial process waste.The regulations which govern the proper generation, hauling and manifesting of these wastes can be found in 35 Ill. Adm. Code Subtitle G: Waste Disposal. The waste resource management includes a hierarchial processes which result in various stages related to waste after its collection. It includes avoiding waste, reducing waste, reusing (recycling) waste, recovering waste, waste treatment and waste disposal. Waste management is the precise name for the collection, transportation, disposal or recycling and monitoring of waste. This term is assigned to the material, waste material that is produced through human being activity. Wastewater is the adversely affected quality of water by anthropogenic influence. It can originate from a combination of domestic, industrial, commercial or agricultural activities, surface runoff or storm water, and from sewer inflow or infiltration. Wastewater, also written as waste water, is any water that has been adversely affected in quality by anthropogenic influence.